In the summer my family loves cooking out. With baseball, vaction and all the other stuff it is tough planning BIG dinners! But just because I don't have time to make big dinners doesn't mean I want to start giving up good tasting food. Thankfully my hubby is a grill master (or at least that is what he calls himself) And okay I admit it the man is pretty good at grilling up food! Most of the time his great flavor comes from whatever sauces or marinades he used. **May is the official kickoff of grilling season with Memorial Day and National burger month. Stubb's encourages all food lovers to try new traditions this summer, including boosting their favorite burger with condiments that pack more flavor and great taste. -Bang BANG Sauce 1/2 up of mayonnaise 3/4 cup of Stubb's Original BBQ. 1 Huge tablesppon of hot sauce! Ummmm yeah to heck with ketchup I am covering my burgers with some bang bang sauce for now on! In a large bowl, mix the ground beef, Beef Marinade, and Bar-B-Q Spice Rub together with your hands. 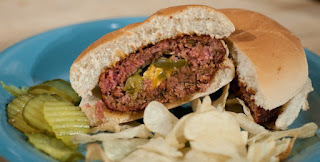 Use about 1/3 cup of meat and press it into a thin patty with your hands. Top the patty with one tablespoon sliced jalapenos and two tablespoons shredded cheese , leaving at least a ¼” rim around the edge. You can adjust toppings according to your taste. Press out another thin patty. Place the second patty on top of the first patty and use your fingers to seal the two patties together well. Repeat another five times to make a total of six burgers. Grill burgers over medium-high heat for 4-5 minutes per side, flipping once during cooking. Baste with Bar-B-Q sauce during last 3 minutes of cooking. Serve on a bun with your favorite toppings.